This post is sponsored by Natural Balance, and the BlogPaws Professional Pet Blogger Network. I am being compensated for helping spread the word about Natural Balance Wild Pursuit™ or Natural Balance Treats, but Blog by Donna only shares information we feel is relevant to our readers. Natural Balance is not responsible for the content of this article. One thing I think all parents to four-legged, furbabies besides dog food is dog treats. We love ’em and want to reward them with a good healthy treat from time to time. We sure do love our Baxter and enjoy giving him treats. We just want to make sure they are nutritious treats. Baxter is a character for sure and deserves a treat worthy of his unique personality. 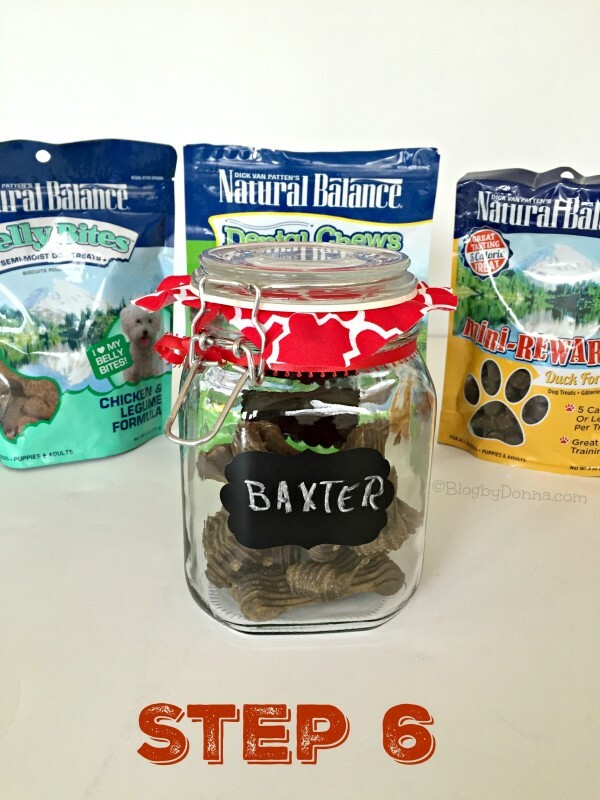 I realized the other day that we have bags of treats just sitting in our sunroom and not only is Baxter to special to not have his own treat jar, but we give him high-quality treats and they should be stored in a nice treat jar, too. So, I decided to make my own DIY dog treat jar. 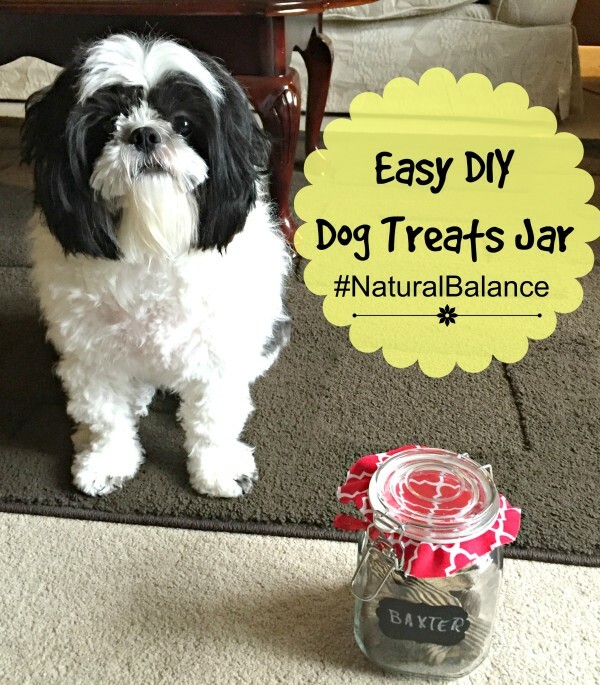 And all my dog-owned friends may be getting a DIY (made by yours truly) dog treat jar filled with the best pet treats from Natural Balance®. Admittedly, I am not very crafty. I also am a busy mom and needed to come up with something easy. While I was out shopping in a local craft store, I was inspired by all the Christmas themed stuff that is out. However, I don’t want to be stuck with a Christmas themed treat jar in July. This led me to choose items that I could change out easily to fit whatever the holiday or season. 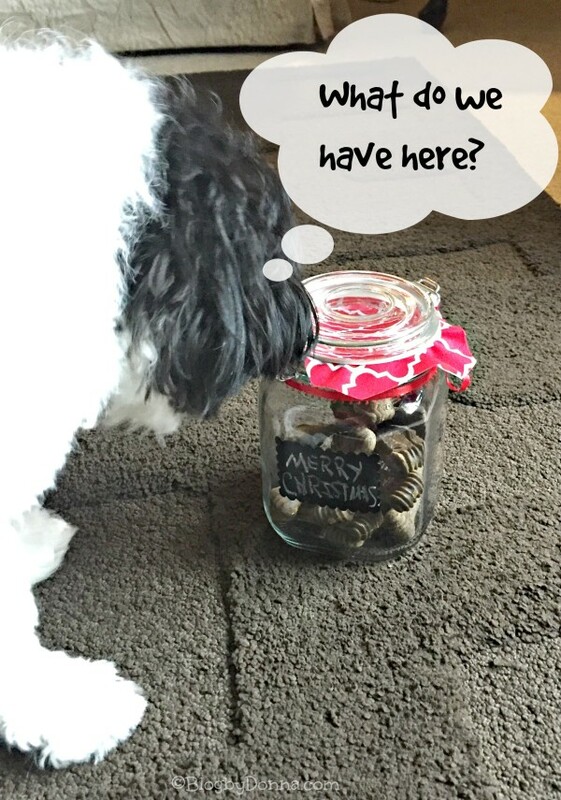 Check out how easy it is to make your own holiday dog treat jar to fill with healthy treats for your dog. 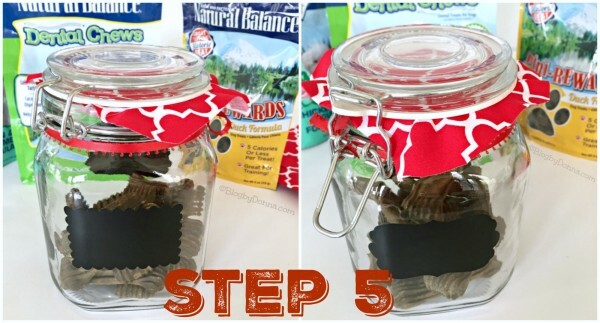 What you need: A jar (I used glass, but you could use plastic), ribbon, scrap material, chalkboard stickers, chalk, scissors and hot glue gun, and healthy treats like Natural Balance, of course. 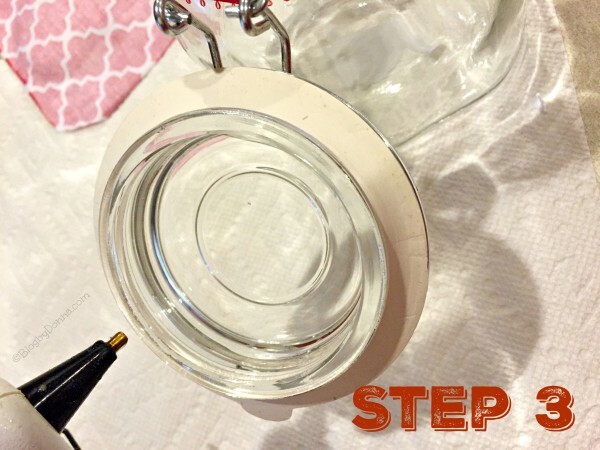 Step 1: Cut your ribbon to the length you need to go around the neck of your jar. You can use hot glue or fabric glue on the ribbon or just tie it like I did. I will be replacing my ribbon for different themes throughout the year. Step 2: Cut a square of cloth that will cover the opening of your jar with about an inch overhang all around. I had this red and white remnant and thought it would go well with my holiday theme treat jar. I can see using a pastel color for Easter or red, white, and blue for the month of July, etc. 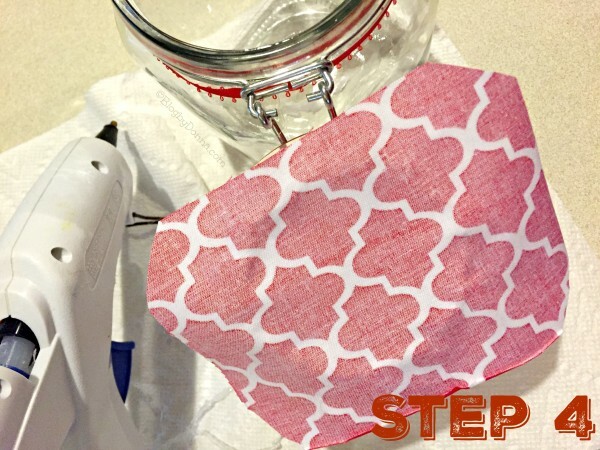 Step 3: Using a hot glue gun or adhesive of your choice, glue the cloth onto the inside of your lid. The glue will adhere to the cloth and glass, but you do have to work quickly. It will stick, yet it will be easy to remove from the glass when I’m ready to change out for the next holiday. Step 4: Make sure that you attach the cloth so that when looking at the top of your lid when closed you are seeing the front side of your material. Step 5: Stick your chalkboard stickers on the front and back of your jar. Step 6: On one side, you’ll write your pet’s name with chalk and on the other side write a greeting, message, or wish. 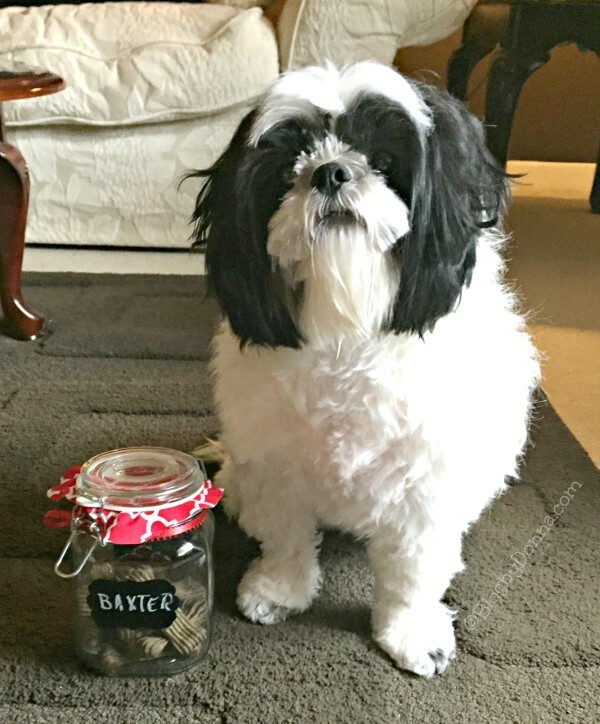 I wrote Merry Christmas since it is a holiday themed jar and fill your jar with the best pet treats like, Natural Balance® dog treats. 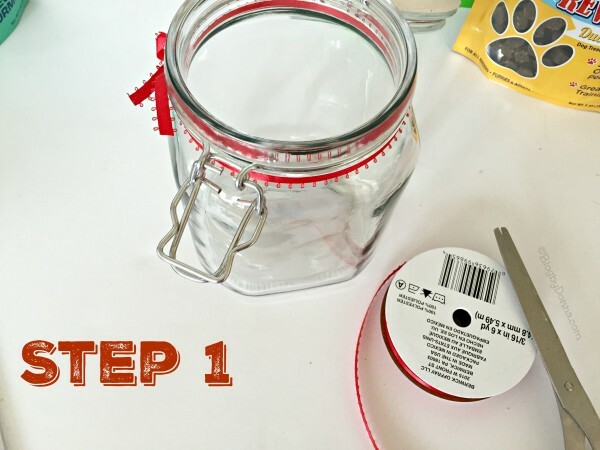 I told you it was easy to make a DIY dog treat jar! 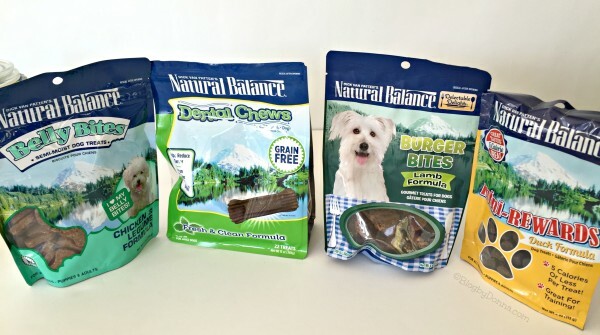 Natural Balance® offers a Buy with Confidence guarantee, they are so certain you and your pets will love them. Check out the store locator page to find where you can buy Natural Balance® treats for your dog and/or cat. Where do you store your pet treats? 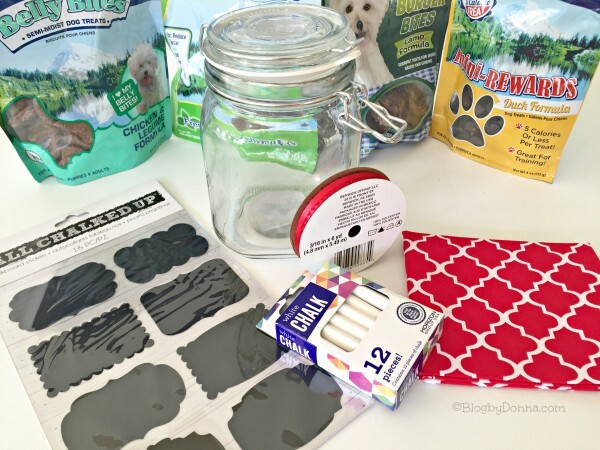 Would you make your pet a DIY dog treat jar? That came out awesome. What a cute way to store your dog treats. Great idea to change out the fabrics for different holidays or seasons! Baxter is so cute!! Hau hau! Baxter is happy with his own jar obviously. I store my dog’s treat in a box that has his photo printed on it. I think he’s happy, too. A treat jar like this is a great idea. It’s so much cuter than just leaving a bag of treats around! Plus the dogs or cats are less likely to be able to break into it, lol. That’s such a cute idea. I think I should make one of these for my dog this Christmas. so easy! my type of craft project! This is a really cute diy. My pup would be so happy to have a dog treat jar. Cute idea, and Baxter is just adorable! This is such a cute idea. I need to make something like this for the holidays. Natural Balance is awesome! Thank You for this great idea. So many times I grab the box and spill it. This is a super cute idea and would make a great gift for any pet or animal lover. It sure looks nicer than keeping treats in the container they come in too! This is such a sweet idea. My dogs are such treat hounds. They would love this. So funny, I always think of snack jars for kids but never for the doggies. I must make one for Jenny the pug, these treats are something she would love I bet! This is an adorable idea. I need to check out these treats for our pup! Baxter looks so happy! You’ve just answered my question about what to get my 4-legged poodle nephew for Christmas. My sister will love the clever, crafty jar and artwork when I’m done, and Pepper will love having all his treats in it. This is a cute treat jar. Your dog is so cute investigating it. That would sure make a great holiday gift for all my dog owner friends. Putting in special treats would be a perfect idea. That turned out adorable. We have so many treats so treat jars are something we need! What a cute treat jar! Thanks for the great storage idea for dog treats. This is so cute and easy! What a great gift for your furry friend. That looks neat. We keep treats in the box. I think I will make a treat jar. 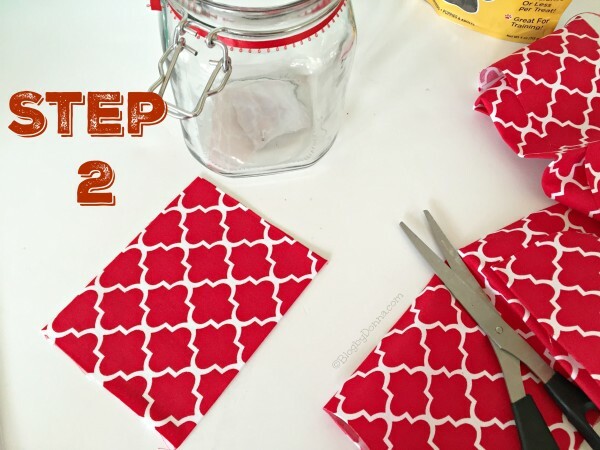 What a cute project and easy to follow instructions. I should make this for our cat food. This came out so cute! I love the personalizing with the little chalkboard! This is so cute! I like the idea of DIY Dog Treat Jar, my puppy would love it I thou. cute(: I love anything diy!! This is adorable, I’ll have to do this for my dog. He would love this. Thank you for this post. i was looking for a gift for my Buddie for Xmas. This will fit the bill. On a note your dog is so cute. This is such a cute idea. We are always looking for cute ideas like these. he Thank you for the share. What a cute idea for our furry friends! They will love this – I can see all tails wagging now!! That’s a great idea, really cute.